Mid Cal Moving & Storage is a reputable Livermore moving company that puts remarkable emphasis on customer care and satisfaction. As a BBB-accredited business with an "A+" rating, we wouldn't have it any other way. 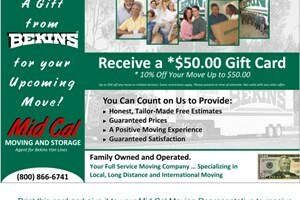 Mid Cal is also a ProMover member of the American Moving & Storage Association. Our Livermore movers have handled thousands of local, national and even international relocations -- producing countless satisfied and repeat customers. Unlike other moving companies in Livermore, Mid Cal is van line-affiliating -- working with Bekins to deliver high-quality solutions for commercial and residential clients throughout Livermore. For more information on Mid Cal Moving & Storage and the comprehensive Livermore moving services we offer, call us today or fill out the Quick Quote form above for your no obligation estimate.